Great pleasure after the successful initial installation of the flexible, expandable e-charging infrastructure: Marco Weiß, Head of New Mobility & Innovations, Tobias Wagner, CEO of ChargeX and Dr Robert Franke, Head of the Office of Economic Development for the City of Dresden. The Transparent Factory in Dresden is expanding its electric charging infrastructure. Extra charging points have been installed at Volkswagen’s Dresden site as part of a joint venture with the start-up ChargeX. Just days after receiving CE certification, the start-up’s first charging solution anywhere in the world has officially come on stream. The idea behind it is as clever as it is cost-effective: the only installation required was a 22 kW wall box. Two additional charging points are now connected using an intelligent power strip. 32 charging points are now available for staff and visitors. Pilot projects are also planned at other Volkswagen locations. 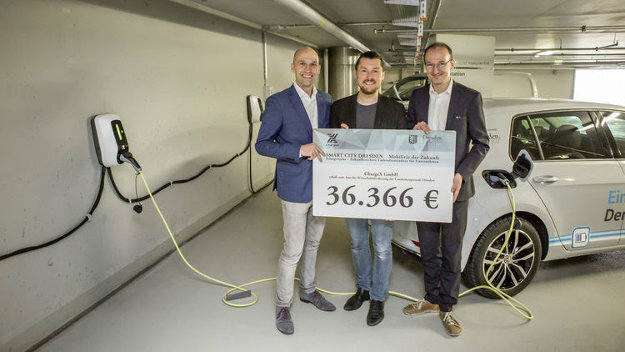 The Office of Economic Development for the City of Dresden is also providing about €36,500 of funding for a pilot project in which ChargeX will conduct practical testing of integrated charging control (load management). The wall boxes which are now available to use in the factory’s underground car park can be extended by up to six modular charging points using a plug&play adapter system. A total of seven electric vehicles can be connected simultaneously. Integrated, intelligent load management ensures that the connected vehicles are not charge in parallel and also maintains the power input. ChargeX developed the idea of a power strip for charging stations as part of the Future Mobility Incubator, the foundation scheme for start-ups in the Transparent Factory. The state capital of Dresden is providing a municipal innovation fund to support the development of new technologies and their route to market. This also includes the ChargeX pilot project to test load management. “The incubator projector in the Transparent Factory provides a real boost for Dresden, which is a hotbed of technology and start-ups. The example of ChargeX provides clear evidence that the cooperation between Volkswagen and the city is bearing fruit. ChargeX’s new charging technology will enable us to further accelerate the development of the infrastructure in Dresden and create a denser network of electric filling stations. This is another step in Dresden’s progress towards becoming a model city for electric vehicles”, explains Dr Robert Franke, Head of the Office of Economic Development for the City of Dresden. Including the new charging points, the Transparent Factory now has 32 operational charging stations. Both quick chargers are available for public use in the electric mobility station, the largest electric filling station in Dresden. 17 electric vehicles are currently in use at Volkswagen’s Dresden site. This means that around two-thirds of vehicles in the official mobility fleet are electrified. And there’s more: In 2018, the Transparent Factory became the first of the Volkswagen brand’s sites to achieve carbon-neutral operation. The power supply from Volkswagen Naturstrom® is free from CO2, while the carbon emissions from the heat supply are 100% offset by the purchase of climate certificates. Since the beginning of 2019, the Volkswagen subsidiary Elli (Electric Life) has been supplying 100 percent CO2-free Volkswagen Naturstrom® to private households and small businesses with and without electric vehicles.